As we close the book on 2018 and look forward to 2019, we pause to remember some of the remarkable records and races we saw in Louisiana over the last year. Mondo Duplantis shattered not only Louisiana and United States records, but a World Junior Record in the pole vault. Sean Burrell ran one of the fastest 400 meter times in the United States, and who could ever forget the 2018 LHSAA cross country state championships. That had to be one of the toughest, muddiest, and challenging races I have ever seen. Cross country season is now over, and we move now to a new year and the beginning of the indoor track season. The first meet is this Saturday, January 5th, in Baton Rouge as LSU hosts the LSU High School Classic. What could the 2019 indoor track season have in store for us? Let's take a look at some of the notables participating in this week's meet! The morning starts off with field events. In the boys pole vault, Cameron Aime from Class B (Maurepas), and 4A runner-up Nicholas Russell (Catholic High NI) look to pick up where Duplantis left off. On the girls side, Gaby Bird (Fontainebleau) and Johanna Duplantis (Lafayette), yes Mondo's sister, will look to go head-to-head. In the shot put, there is one name you should remember - Zechariah Blake (John Curtis). He is the current indoor champion in shot put and outdoor champion in discus and javelin, finishing third in the shot put outdoors. Alacia Myles (Edna Karr) should have a good shot to podium in the girls high jump, and Damon Herod (Denham Springs), who is the 4A runner-up, should contend in the boys long jump. Finally, in the girls long and triple jump, keep an eye out for Orsciana Beard (Zachary), who was the 5A runner-up in the triple, jumping right at 40 feet as a freshman. Next up: the running events. The relay races will be wide open, as runners vie for a permanent spot on their respective 4 person teams. 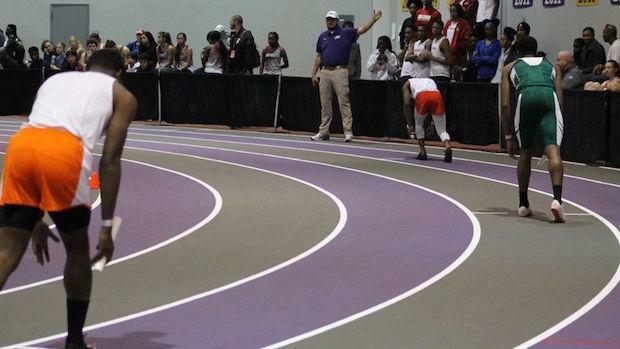 In the sprint races, a name that stands out in the 60m dash is returning indoor champion, Kam Jackson (West Feliciana). He ran a 6.86 to capture the 2018 indoor championship. In the boys 60m hurdles, L'Jean Mckneely (Zachary) will look to improvehis 3rd place in the 2018 indoor championships, and Orsciana Beard (Zachary) will wrap up her day in the girls 60m hurdles. The distance races have tons of Louisiana talent. In the girls 800m, Laila Jackson (John Curtis), finished 2nd in outdoor track and has a sub 2:20 PR. In the boys 800m, 2018 5A cross country state champion and University of Colorado signee, Hunter Appleton (Brother Martin), drops down from the longer races to get in some speed work. In the girls 1600m, the one to beat is Mary Nusloch (Sacred Heart). She is the 2018 indoor champion in the 800m and 1600m, and outdoor champion in the 1600m and 3200m. She boasts a PR of 2:16 in the 800m, 5:10 in the 1600m, and 11:21 in the 3200m, respectively. That's tough to beat regardless of classification! The boys 1600m will see notables Collin Hedges (Catholic High), Samuel Avants (E.D. White), Benjamin Bone (St. Martin's), and Octavio Vasquez-Tilley (Ruston) go for the podium. Hedges and Avants have PR's in the 4:20's, Bone is a 3-time runner-up in 1A cross country with a 4:36 PR, and Tilley is coming off a top 5 finish in 5A cross country. The girls 3200m field has three top 5 finishers from the 5A cross country championships. Teammates Isabelle Brown (St. Joseph's), 5A cross country state champ, and Lauren Hendry (St. Joseph's), 3rd in cross country, will battle each other while 5A 5th place finisher in cross country, freshman Marina Givens (Ruston) has a bright future. In the boys 3200m, Samuel Avants (E.D. White) will pull double duty and battle favorites Marshall Buhler (Fontainebleau) and James Lalonde (Catholic High). Lalonde was the 2018 state runner-up in 5A cross country. This looks to be an exciting 2019! It will be interesting to see what records may fall this year. Only time will tell! Good luck to all the athletes this track season and check back with us to see how the results play out.